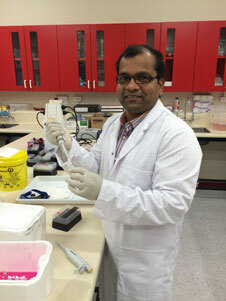 The study, led by Department of Physiology researcher Dr Rajesh Katare, is the first to compare the cardiac repair potential of three types of stem cells from an individual patient. In recent years, the approach of harvesting and transplanting a patient’s own stem cells to help heart repair has garnered much interest internationally. However, determining the best cell type to use remains a large challenge. To help overcome this challenge, Dr Katare and his team used cultured stem cells from 14 patients undergoing coronary artery bypass graft surgery to compare the function of three types of adult stem cells. Two were from the patient’s heart itself – the left ventricle and the right atrium – while the third was from the circulating blood of the same patient. After simulating the conditions of low oxygen levels and lack of nutrients present in heart disease, he and his colleagues then studied the therapeutic effects each of the three stem cell types in repairing the damaged heart cells. They found that the right atrial stem cells had the greatest protective effect on heart muscle cells, while the ventricular stem cells were the most effective at promoting the formation of new blood vessels. The third cell type, endothelial progenitor cells, was also equally effective at promoting blood vessel growth, but these cells’ potential to be cultivated outside of the body and to migrate to the site of injury in heart cells was found to be significantly lower. Dr Katare says that if the findings can be replicated in clinical trials, this would suggest a need for personalised stem cell therapy depending on the type of heart disease present in a patient. “Our findings also provide a possible explanation for several failed clinical trials in stem cells therapy,” he says. The study, which was supported by grants from the J&C Anderson Trust and the Heart Foundation of New Zealand, appears in the International Journal of Cardiology. Story from University of Otago. Please note: The content above may have been edited to ensure it is in keeping with Technology Networks’ style and length guidelines.